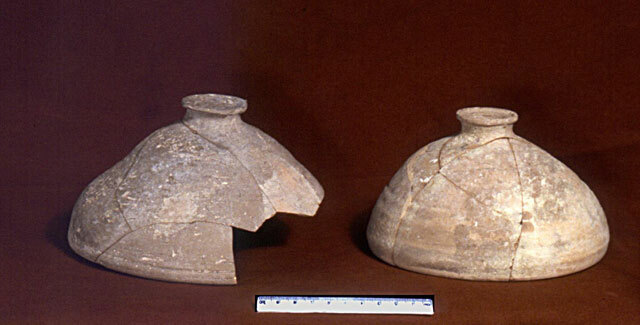 During January–February and September–October 2000 two seasons of salvage excavations were conducted along the northern bank of Nahal Refa’im (Permit No. A-3187; map ref. NIG 21665–700/62790–900; OIG 16665–700/12790–900), in the wake of damage to antiquities caused while improving the drainage in the channel. The excavation, on behalf of the Antiquities Authority and funded by the Gihon Water Company, was directed by S. Weksler-Bdolah, with the assistance of laborers from Kafr Yatta in the first season, which was suspended due to inclement of the weather, as well as the following participants in the second season: S. Cohen (area supervision), T. Kornfeld, A. Hajian and V. Pirsky (surveying), C. Amit (field photography), J. Negeur, R. Abu-Diab and N. Davidov (treatment of mosaic floor and its transfer to the Rockefeller Museum), E. Kamaisky (pottery restoration), C. Hersch (pottery drawing), E. Altmark (metallurgical laboratory) and D.T. Ariel (numismatics). 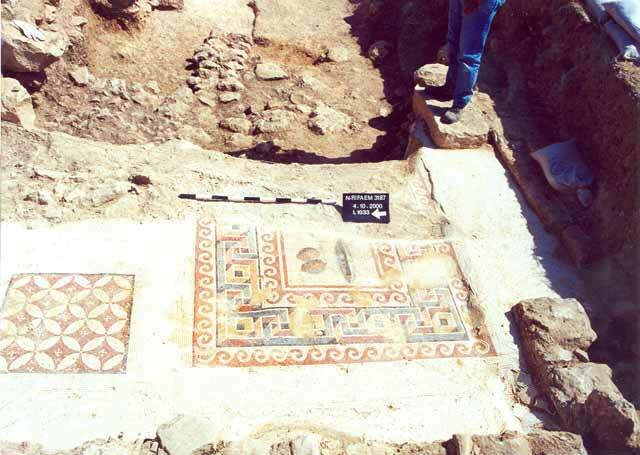 The mosaic floor and the wall paintings that adorned the exposed Roman villa at the site were researched and will be published by R. Talgam and S. Rosenberg within the final report. Thanks are also due to A. Va‘aknin and the workers of the adjacent site of ‘En Ya‘el for their assistance. Earthmoving works created a deep trench that extended to a distance of dozens of meters, c. 10 m north of the channel’s bank. Four squares, excavated down to bedrock, were divided between two inside the trench and the other two, to its north. Three main strata were identified in the excavation. The earliest and lowest (Stratum III) revealed a building or installation from the Hellenistic/Early Roman period; the middle layer (Stratum II) comprised part of a room with a mosaic floor that belonged to a villa, dating to the Late Roman period and the latest and upper layer (Stratum I) consisted of a potter’s kiln from the Late Roman/early Byzantine period, preserved in its entirety and a nearby heap of debris that yielded numerous fragments of vessels. Stratum III. Part of a building or installation was exposed. Sections of two walls that formed a corner and stood a single course high were preserved (Fig. 1). The dry construction walls were founded directly on bedrock and consisted of two rows of medium-sized fieldstones. The floor of the building did not survive. The soil fill above bedrock contained fragments of vessels, the latest of which dated to the Hellenistic or Early Roman periods. Four Hellenistic coins (IAA Nos. 96277, 96278, 96279, 96285) are attributed to this stratum, three of them were minted during the reign of Alexander Jannaeus. Stratum II. A room paved with a mosaic floor that belongs to a Late Roman villa was exposed (presumed interior dimensions 3.2 × 3.2 m). The eastern part of the room was damaged twice, in antiquity, when the potter’s kiln (Stratum I, below) was installed, as well as during the current heavy machinery activities. The room was entered from the south by way of a wide doorway (width c.1.4 m). Three steps in the northwestern corner of the room led northward. The white mosaic pavement in the room had two carpets, richly adorned with patterns and colors. The first carpet was large and situated next to the main entrance; the second carpet was smaller, to the north of the large one and in front of the steps (see Fig.1). A rectangular panel (width 0.55 m) is discerned in the large carpet (length 1.5 m, presumed width 2.5 m) It is adorned with a possible clam, having two shells, or perhaps a metal bowl; above it is a pair of fruit (?) that appear to be pinecones or artichokes and to their east maybe the head of a fish (?). The main pattern is enclosed within a red frame (width 0.45 m) that is surrounded by a frame with a running coil pattern (width 0.2 m), which is repeated at the margin of the carpet. The wider band between the two running coil frames contains a meander pattern, which is tri-dimensional and painted in gray, yellow, red and white colors, unlike the red color of the running coil frames. The top of the coils in the interior and the exterior frames of the running coil face the meander pattern and their base forms a continuous line. The northern carpet is square (0.6 × 0.6 m) and enclosed within a thin black frame. It is decorated with a geometric pattern, made by a compass, whereby four-petal rosettes are intertwined to form circles. A small flower-like decoration occupies the center of each circle. The background of the carpet is red and the pattern is depicted in white. The northern, western and southern walls of the room were decorated with colored secco that was partially preserved, surviving one to three courses high above the floor. Based on the style of the mosaic, the colored wall decorations and a few potsherds in assemblages associated with this villa, it is possible to date the structure to the Late Roman period, probably the third century CE. Stratum I. An elliptical potter’s kiln was exposed (length 3.3 m, max. width 1 m, preserved height c. 2 m). Its southern part was damaged by heavy machinery prior to the excavation. It was built on a cleaned and smoothed bedrock surface, in which a pit was hewn for the bottom part of the kiln that consisted of the firebox. The upper part was the chamber where the vessels were placed. The kiln was surrounded by a wall (width 1.5 m), built of medium-sized fieldstones, whose bonding material was not preserved. Built around the interior circumference of the kiln were alternating square pilasters that protruded into the kiln’s space. The hot air from the firebox probably rose to the chamber by way of the narrow passages between the square pilasters. 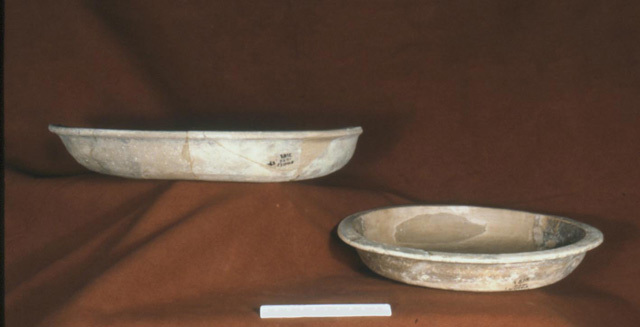 Several complete broken vessels, mainly platters with a wide flat base (Fig. 2) and jar lids (Fig. 3), as well as fragments of other ceramic types, were found on the floor of the chamber and in the red-soil fill that accumulated inside. The chamber was sealed with a layer of red mud bricks and stones that were originally part of the collapsed kiln’s ceiling. Surrounding the kiln was a layer (thickness 0.3 cm) rich in pottery fragments and wasters. The assemblage of pottery vessels in the kiln and the wasters, as well as the five coins that are dated to the years 335–408 CE, enable us to suggest that the kiln operated during the second half of the fourth century CE, or latest, at the early fourth enable us to suggest that the kiln operates during the second half of the fifth century CE.